Lebanon Valley opens up at home against rival Widener, looking to avenge a one-touchdown loss to the Pride in 2013. LVC will try to even its record at 1-1 after a late F&M score won the battle in their season opener last week. The game is being video streamed live and for free on LVCtv. [Forecast] Cooler and cloudy, highs in the upper 60s with a 50% of a rain shower. [Directions] Admission, available at the gate, is $5 for adults, $3 for seniors, and $2 for non-LVC students. LVC students are free. Lebanon Valley looks to bounce back from a battle at F&M that saw them fall 28-21 on a late Dips touchdown. Widener comes in receiving votes in the D3football.com Top 25 after upsetting #15 Rowan in their opener last week. Both teams have receivers coming off big games last week. LVC's Tyler George, a MAC Honor Roll recipient, had 117 yards and 3 TDs, while Anthony Davis had 136 yards to become Widener's career receiving leader. Lebanon Valley has won seven of its last eight home openers dating back to 2006. Lebanon Valley is trying to snap a three-game losing streak to the Pride; three of the last four games have been decided by one score, including overtime in 2012. The game is the 70th meeting all-time ... Widener leads the series 43-24-2 ... After LVC won three straight from 2008 to 2010, Widener has won three in a row ... Two of the last six meetings have gone to overtime ... Coach Jim Monos is 6-15 against the Pride ... The two teams first met on Nov. 30, 1933, a scoreless tie. Widener was still known as Pennsylvania Military College until 1972. Senior wide receiver Tyler George was named to the MAC Weekly Honor Roll on Monday for his play against Franklin & Marshall in the season opener. George caught three touchdowns among seven receptions for 117 yards, all career highs. A fourth-quarter comeback was not in the cards as Lebanon Valley fell at #24 Widener, 35-28, in the Middle Atlantic Conference opener. The Dutchmen couldn't find an answer for the Pride's quick-strike offense as Seth Klein threw for 392 yards on 40 completions. Darryl Sweeper and Joey Miller '14 had receiving touchdowns for the Dutchmen, while quarterbacks Brian Murphy and Jeremy Franck each ran for scores. Widener ran a frantic first-half pace, getting off 50 plays before the break as they jumped out to a 24-7 halftime lead. Last Saturday, Franklin & Marshall scored with 2:26 remaining in the game to break a tie, then held Lebanon Valley on a late charge to win 28-21 in the renewal of the two teams' rivalry. Meeting for the first time since 1982, the two went back and forth in their season opener, with all three Dutchman touchdowns coming on Tyler George catches. An hour and 48-minute thunderstorm delay at halftime split the game in two, and F&M capitalized with touchdowns in the third and fourth quarters to win. Brian Murphy threw for 198 yards and three touchdowns, all of them to George, who finished with 117 yards on seven catches to lead the offense. Both defenses were stout, with LVC limited to 297 yards overall and F&M 300. Frank Gaffney led the Dutchmen with 12 tackles and a sack, while Kevin Antol dropped nine tackles with three for a loss. Bryan Ek came up with a key second-half interception that led to LVC's third touchdown. LVC had a late drive to try and tie, but a shot at the end zone fell short as time expired. Lebanon Valley's offense line has been outstanding in pass protection over the past season plus. 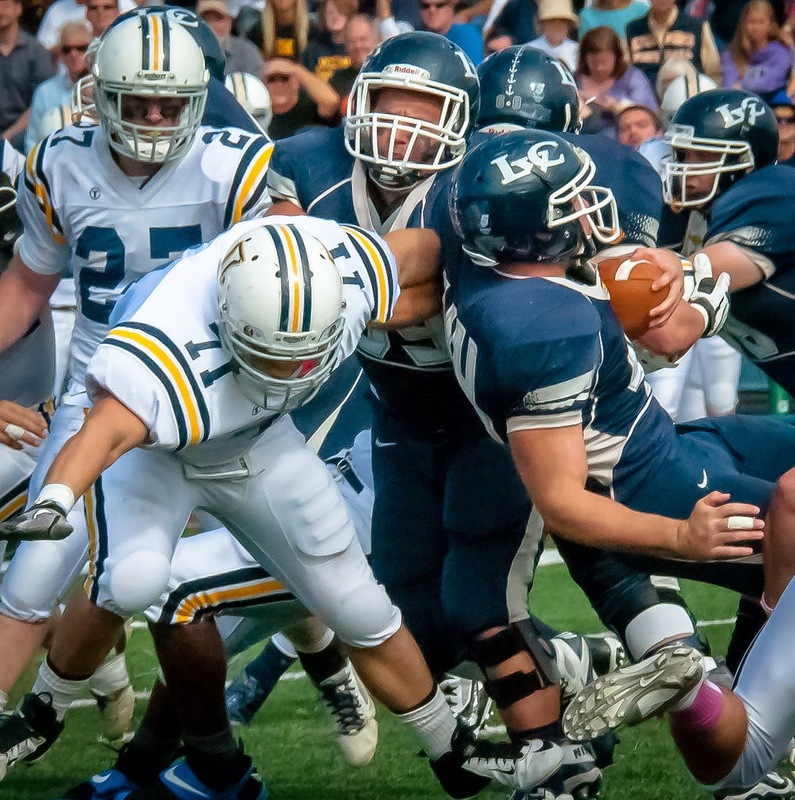 Over the last eight games stretching back to last season, LVC is allowing only 0.875 sacks per game. In that span, the Dutchmen have notched three sack-free outings, including last week at F&M. Brian Murphy's 34 passes without a sack taken were the most since 2001, when LVC attempted 43 passes without taking a sack at Gettysburg. Lebanon Valley seniors Tyler Dean, Frank Gaffney, and Zach Wierman have garnered invitations to the Dream Bowl senior all-star game. The trio were identified as among the nation's outstanding seniors, and received invitations to play in the game on Jan. 19 in Virginia Beach. Last year, Joey Miller '14 and Kevin Smith '14 both played in the game, joined by LVC's honorary captain Levi Hain, who participated as part of the Coach to Cure MD program. Senior wide receiver Tyler George had a pretty good "what I did on my summer vacation" story when camp began. George was called on to catch New York Giants quarterback Ryan Nassib at Arnold Field on July 7, getting in a half-hour workout with the former Syracuse QB, who was at LVC to be evaluated in the Physical Therapy department's BodyArmor injury prevention program. Last weekend's thunderstorm delay at F&M was the longest on record in program history at an hour and 48 minutes. It was LVC's first weather delay since the 2012 home opener against Misericordia, which was also halted by lightning at halftime. Wide receivers Tyler George and Darryl Sweeper, tight end Seth Miller, left guard Ryan Dotson, and right guard Tyler Good all made their first career starts ... George had a career day, catching all three of LVC's touchdowns with seven receptions on 10 targets for 117 yards ... Sweeper caught three passes for 37 yards, including a 38-yarder, while Mike Smith had three for 28 and Joe Bennett two for seven yards ...Brian Murphy was 16-for-34 for 198 yards and three touchdowns, and did not throw an interception or take a sack ... LVC's run game was held in check by the Dips, gaining only 99 yards led by Brendon Irving(35 yards) and Spencer Moser (35 yards) ... Fullback Bobby Conlon also had a pair of carries for 15 yards ... The offensive line did not allow a sack in 34 dropbacks by Murphy ... It was LVC's third sack-free game in its last eight outings, averaging fewer than one per game in that span ... Left tackle Tyler Dean started his 30th career game last week and leads active players in starts. The Dutchmen had four first-time starters on defense, with defensive end Andrew Livingston, safeties DJ Johnson and Kevin Antol, and cornerback Bryan Ek getting nods ... LVC allowed 300 yards of total offense to the Dips while being on the field for more than 36 minutes ... The Dutchmen forced a pair of three-and-outs ... Preseason all-American Frank Gaffney had a game-high 12 tackles, including 10 solo stops, with a sack ... His 12 tackles led all MAC players last week ... Antol also had a career-high nine stops with 3.0 for a loss, and Trevor St. Clair added seven tackles ... Ek snagged his second career interception to set up LVC's third-quarter touchdown ... Johnson had a break-up to go with five tackles ... LVC compiled seven tackles for a loss led by Antol's 3.0 and Gaffney's 1.5; Alex Beamesderfer, Zach Wierman, Joe Scerbo, and Livingston also had hits behind the line. Matthew Smoluk made his first career start at kicker and was a perfect 3-for-3 on extra points ... LVC did not attempt a field goal last week ... Jeff Hacker had a solid punting day, averaging 35.5 yards on four boots with only two returnable ... LVC only allowed 17 yards combined on the four punts and held F&M to a 14.0 yard kickoff return average ... Bryan Ek took back one punt for three yards and averaged 18.0 yards on three kick takes ... Spencer Moser took his first career kickoff 18 yards, and Kevin Antol snagged a short kick for a 16-yard return ... Mike Smith handled holding duties with Trent Mars and Frank Gaffneysplitting long-snapping duties on place kicks and punts, respectively. Widener, who received votes in the D3football.com Top 25 this week, upset #15 Rowan last Friday 19-7. The Pride defense generated seven turnovers, including six interceptions, to win on the road. Philip Ragona and Haydn Warren had receiving touchdowns while Sean Titus sealed the win with a late pick-six. Seth Klein threw for 220 yards and two touchdowns, with Anthony Davis catching seven balls for 136 yards, but it was the defense - led by two-pick games from Titus and Jamal Goodman - who won the game, holding Rowan to only 246 yards of offense, including 133 in the air. LVC visits Stevenson Sept. 20.